Adoniram Judson, Jr. (1788–1850) was America’s first foreign missionary. Judson and his wife, Ann, arrived in India in 1812 to work with the famous English missionary, William Carey. After a short stay, they went to Burma (now Myanmar), and for the next 38 years Judson preached Christ where he had not been named. His translation of the Bible into Burmese is still used in Myanmar today. Judson also produced and distributed millions of tracts to the Burman people. During his lifetime, he completed the translation of the Bible and other works into Burmese. He compiled a Burmese-English and English-Burmese dictionary, a Burmese grammar, and Pali dictionary. And great difficulties did come his way. During the war between the East India Company and Burma, Judson was imprisoned for almost two years, charged by the Burman government with being a spy. Only a few months after being freed from prison, Judson’s wife, Ann, died of a fever on October 24, 1826. Although they had three children together, all three died within the first couple years after their birth. Eight years after Ann’s death, Judson married the widow of a fellow missionary, Sarah Hall Boardman. They had 8 children over 11 years of marriage. Three of the children died at an early age and sadly, Sarah also died. 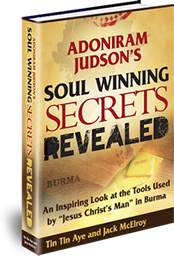 Now for the first time you can read and study the arsenal of “soul winning tools” used by “The Father of American Foreign Missions”––Adoniram Judson. This is the only book in the world that contains an outstanding collection of the four most prominent tracts Judson used as well as the first translation of Judson’s newly discovered fifth tract that he used as a primer on the Old Testament promises of a Savior. Even if you reviewed the well over 5,000 pages of text in 17 volumes published in the 160 years since Judson’s death, you still couldn’t find everything that is presented in this book. “Epitome of The Old Testament”––This 42-page text was written in Burmese in 1823 and published a few years later. Its contents have been hidden from the English-speaking world for 190 years. What a treasure! Judson’s “hand-picked Greatest Passages” from the Old Testament, Psalms, & Prophets about the coming of the Savior are contained in this tract. This is the first English translation made from the only known copy. “The Investigator”––First authored by fellow missionary Jonathan Wade, Judson revised and used this tract extensively. Like the Epitome, it has never before been available in the English language. Now it has been newly translated from a copy of an original 100+ year-old Burmese tract. Presented in a 63 question & answer format, The Investigator challenged the Burmans to consider the facts of Buddhism versus Christianity and choose between them. “The Catechism”––This was Ann Judson’s first soul winning tract, so widely used that by 1890 it had gone through 27 editions making 273,000 copies. This is the first English translation from the Karen language. “The Golden Balance”––Long buried and hidden in the appendix of a rare 155+ year-old book, this 1829 Judson tract shows by stark contrast the excellency of Christianity and the deficiency of Buddhism. Judson found the tract so effective that they published a total of 100,000 copies in 4 years. “A View of the Christian Religion”––Interestingly, this tract contains Judson’s prediction that Christ would return and set up his kingdom on earth before 2016. This also was the first text ever printed in the Burmese language. It sets forth the main teachings of the Bible and what it means to be born again in an amazingly simple way. “The Star in the East”––We obtained an original 1809 printing of Rev. Claudius Buchanan’s (1766–1815) sermon entitled “The Star in the East.” An extremely rare find, to our knowledge this is the first and only time this sermon has been reprinted since originally published. Judson read it while still in his early 20s, and it was of great influence in causing him to give his life to missionary work and Bible translations. Claudius Buchanan, a chaplain serving the British East India Company, preached this sermon in Bristol, England. He had done much to advance Christianity and native education in India especially by organizing systematic translations of the Scripture. Now you can read the same words that sunk down deep into Judson’s heart and led him to abandon his home, country, and the ease of a more civilized life for chains, prison, and torture and the founding of the Church in Burma! “Adoniram Judson’s Spiritual Secrets”––Would you like to know the secret to Judson’s “staying power” after he had buried 2 wives and 7 children on the field? Here you’ll find a selection of resolutions Judson adopted to “devote” himself to Christ: 16 specific journal entries cover over 23 years. It also contains his remarks to young prospective missionaries in which he specifically answers the question: “What influenced me most in going to the heathen.” Can you guess what his answer was? “Judson’s Tract Evangelism”––In addition to being “The Father of American Foreign Missions,” you’ll find striking evidence as to why Judson and his team may very well have been some of the greatest tract evangelists America ever produced.